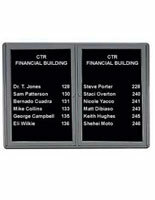 Need a display that can easily be changed? These letter boards make it easy to create custom messages and later, alter them. They each feature a grooved vinyl surface in black or white. This area makes it easy to snap characters into the backing for hassle-free customization. Letter boards like these are great for showcasing directories, pricing information, restaurant menus and schedules to visitors and passersby. These models all feature a strong plastic, wood or aluminum frame that will last for years whether it is a floor stand or a wall mount. Our letter boards, also known as changeable letterboards, may have an enclosed design with doors or an open face for quick memo alteration. Each one is unique, making them ideal for any environment. 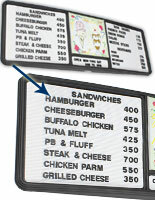 What different features do these changeable letterboards come with? 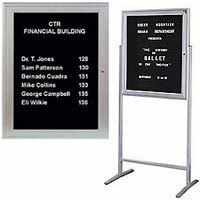 As mentioned before, these letter boards are available as a wall mounted or free standing fixture. 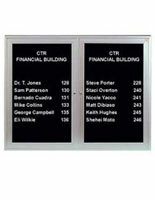 Units for vertical surfaces can feature one or two areas for showing messages. Floor stands feature a weighted base for additional stability. 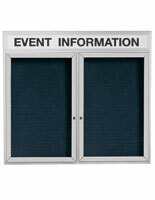 Letter panels can come with an enclosed or open face construction for different users. 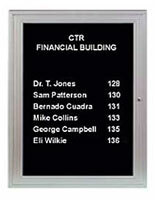 Most wall mounted signs are enclosures and can come with a lock for securing messages from tampering. 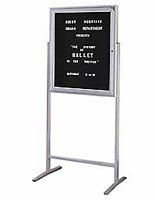 Most floor stands feature an open face for simple alteration. 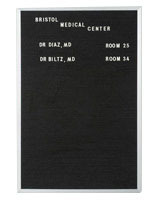 These directory signs are available with different backing surface colors. A white surface is great for contrasting black lettering, while a black backing is ideal for use with white characters. Characters and fixtures are available in both shades to meet any need. 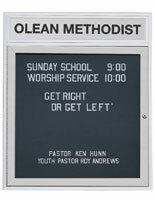 Plastic lettering boards with doors can feature one of two designs. Units with sliding glass panes are excellent for saving space in a hallway, because they do not require passersby to move out of the way to open. 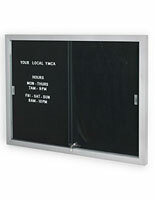 However, models with swing-open doors offer a professional appearance and can include matting. Both types can come with a locking feature. 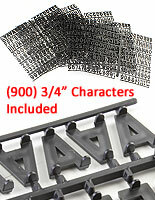 Some wall mounts offer a customizable header for vinyl symbols. 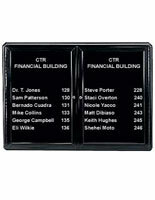 These allow for another messaging area that can be used for titles, business names or company slogans. 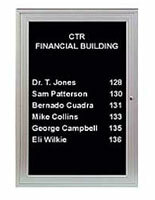 Others feature a write-on area for dry erase markers, for quick messaging creation. Letter panels are available in different finishes for use in a variety of settings. Many units, both floor-standing and wall mounted, feature a satin silver aluminum frame that has a neutral appearance for any environment. Other models with a metal fabrication are available in black, gold and gray for use in a number of locations like restaurants, hotel lobbies, office building entrances and school hallways. 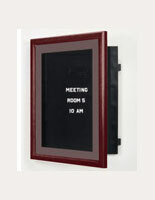 Changeable letterboards for directories may also be made out of wood, and they have their own set of attractive finishes. These include mahogany, cherry and light honey maple. 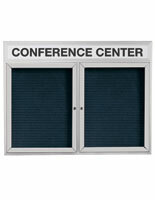 Natural shades like these are excellent for use in both professional and casual environments. What characters are available with these changeable letterboards? 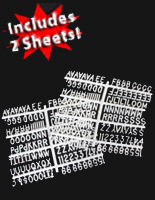 Black character sets are available in (2) sizes: 0.75" and 1" tall. 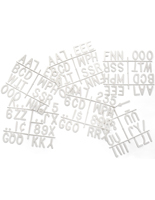 These are made of injection-molded plastic and feature a lightweight, strong fabrication. 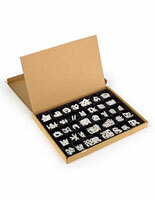 Characters measuring 0.75" come in sets of 900, while 1" kits include 930 individual pieces. White sets can come in (3) sizes: 0.75", 1" and the larger 3" tall symbols. 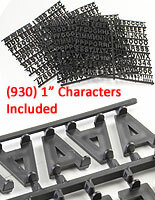 Like the black characters, these plastic pieces are available in large quantities for extra convenience. 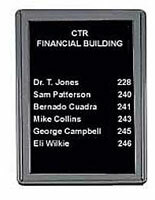 Many message boards include their own character sets, while some do not. Read each description to know if messaging materials are included, and if not, what sizes are compatible. 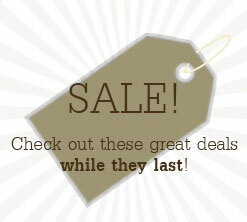 Signs like these made excellent directories, pricing displays and much more. Whether they have a wood or aluminum frame, they are made for withstanding high traffic environments like offices and restaurants. 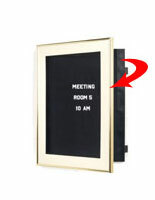 For more durable displays, shop online at CorkBoards2go.com for quick shipping and wholesale pricing!